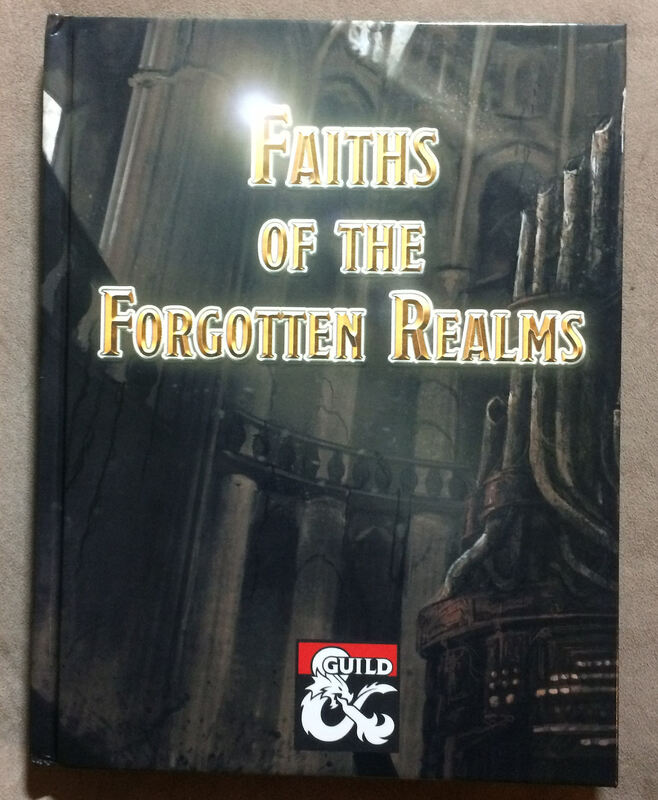 Would you like to add some faithful flair to your Forgotten Realms campaign? 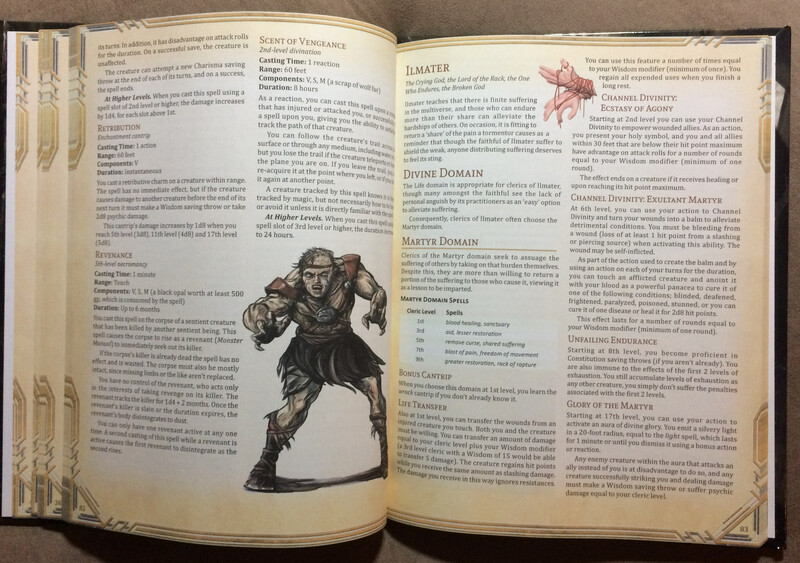 Within these pages, you’ll find what you need as a player or Dungeon Master to bring the 48 gods of the Faerûnian pantheon to life. The book also includes the faiths of Corellon and Moradin. 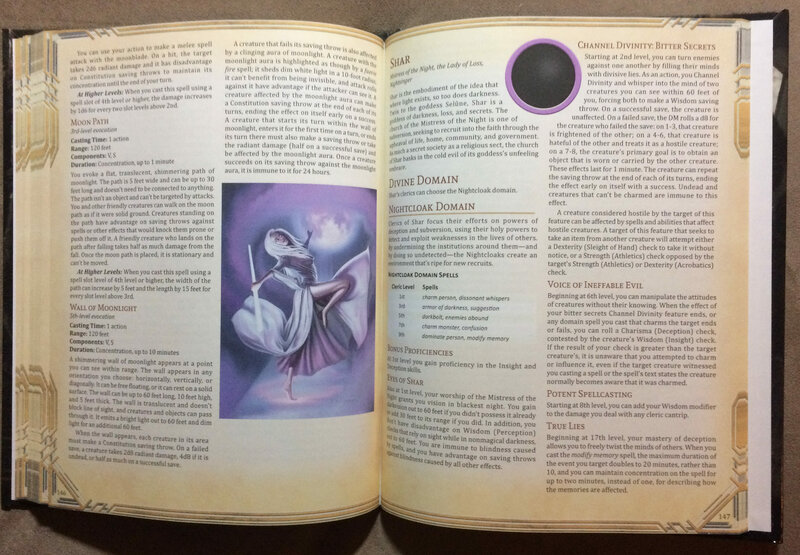 Become a vassal of the gods and goddesses with over one hundred spellcasting archetypes that have access to spells only useable by the faithful. Learn about the Calendar of Harptos and the festivals and practices that define each church. Reward your players with holy magic items or turn their world upside-down with coveted holy texts and world-shaking divine artifacts. Hi ! I would like to use your conversion of the Iron Helm of Heroes in a product which will be sold here. Is it possible ? I will of curse put you in the credits with a link to this product but please feel free to tell me if you would have a problem with that. We would be happy if you used our conversion of the Iron Helm of Heroes in your product and included a link back to this title. Thanks for asking! I sure will ! Thank you. Hello! First off, I love this .pdf so much! I have a question about the spell False Dawn. Most of the spell pertains to dealing with undead but one section specifies creature ("The creature is outlined in a dancing fiery aura..."). Should that actually be undead or does that part of the spell work for any creature inside the 60 foot sphere? Thanks for the question. Micah made that spell but I may have edited it slightly from its original version. I'll often vary the wording to reduce repetition. From reading the spell right now, it looks like the last paragraph clarifies that the fiery aura only affects undead creatures. I'll send Micah a message to see if that is how he intended the spell to work. I hope you like the book! Yes, I just confirmed with Micah that the spell only affects undead. I should have stated 'undead creature' in the first sentence so that it would be more clear that the use of 'creature' in the following sentences referred to the undead. Thanks for bring this to our attention. I'm glad you like the book! Thank you so much! I just wanted to make sure I was reading it correctly! Thank you for such a quick response. Is my girl Shiallia included in this book? Sorry, that deity wasn't included. This reminds me that I need to post a list of the deities on the product page. 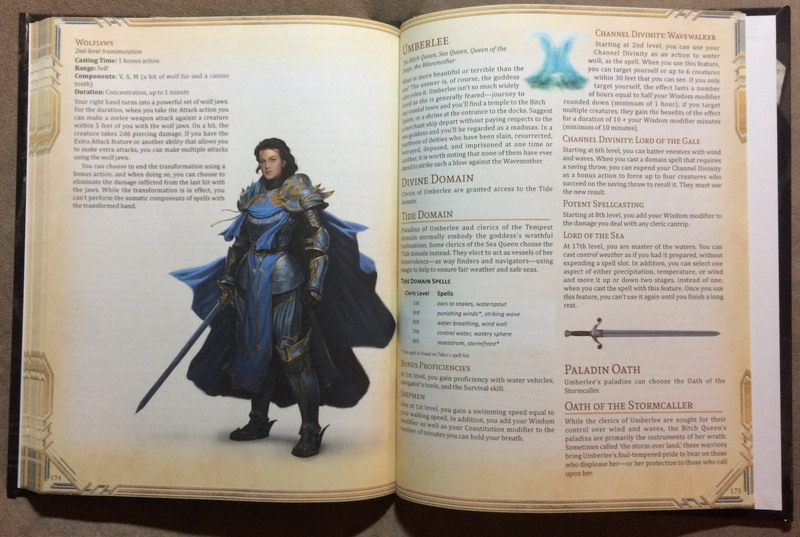 The deities included in this book are the 48 main deities of the Faerûnian pantheon included in the Sword Coast Adventurer's Guide plus Corellon and Moradin. Hi, this looks like a fantastic product - are there any plans to bring it to Fantasy Grounds? Hi, Rajen! Thanks for your interest. 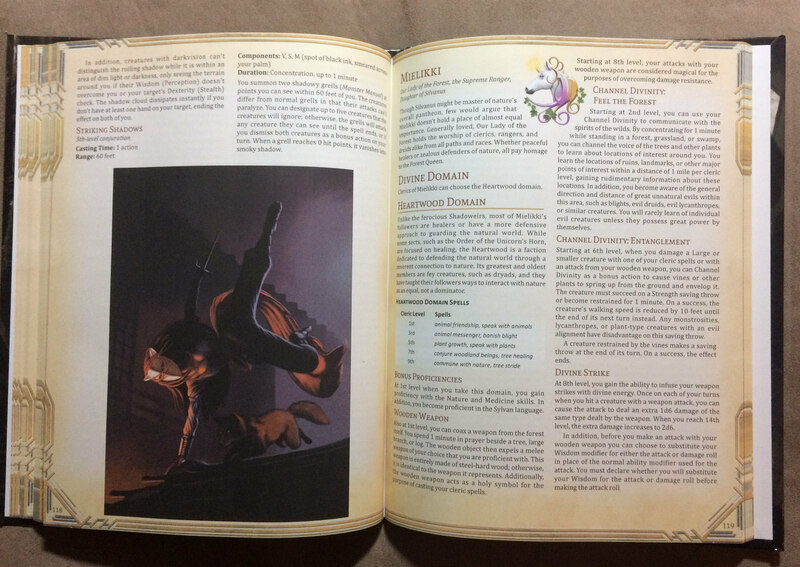 We worked with Rob Twohy to produce a Fantasy Grounds module for this book. The link is at the bottom of the product description on this page just under the thumbnails linking to our other products. I would love to be able to leave a review, but for some reason can't. I love this book and can't wait to implement it into my Forgotten Realms campaigns. My only complaint, and it is minor, is that Sharess was not included in the book. Hi, Robert! Thanks for purchasing the book. I am happy to hear that you like it. Sometimes, the system takes a few minutes or longer to update and allow purchasers to leave a review. If you check back in an hour, you might be able to access the review tools. I hope you have many great gaming sessions ahead using the new content! We are currently working on content for the other deities of the Forgotten Realms. I'll explore options for including Sharess in the lineup. I'm thinking of ordering the Hardcover Color Book (Premium Heavyweight) do you have a picture of the cover art, you have preview of some inside pages (which look great) but before i make the leap from the pdf to the hardcover I'd love too see a preview of the book cover. Hi, Joshua. Thanks for your interest in purchasing the book. 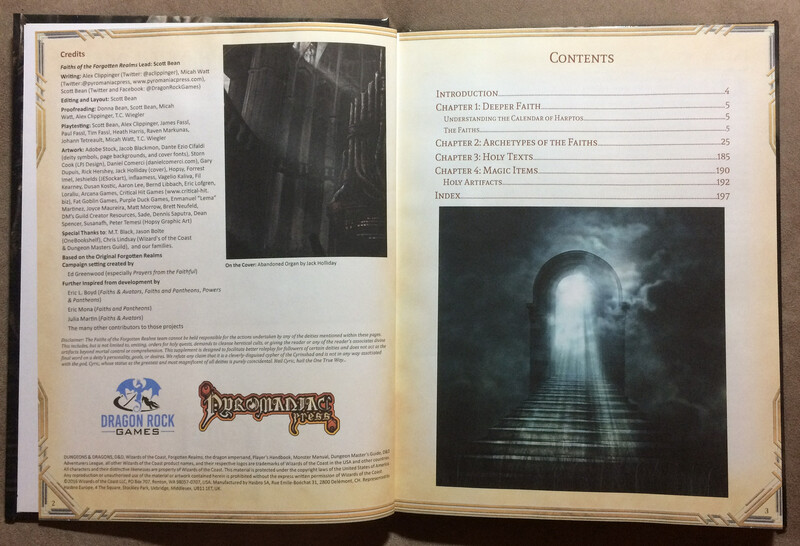 I have been meaning to post a few pictures of the physical book. I'll try to update the product page with a few pictures this weekend. I'm not a professional photographer with a quality camera, but I'm going to try and take a few pictures worthy of posting. Any luck on those cover pictures? Thanks for asking, Joshua! I have updated the product page with several images of the hardcover and page spreads. If you right click an image, you should be able to select 'view image' for a close-up of the picture. Thanks, Joshua. I hope you get great use of the book and many enjoyable sessions! I'm very satisfied with your product overall. However, since I'm trying to catalogue all my third party ressources (including updating spell lists) I'm a bit confused about the spells in this volume. Actually, I just don't see any section regardings spell lists, as in: who actually get's to choose the new spells. Is it only clerics? Is it clerics and paladins? Only paladins? Rangers? Druids? Bards? 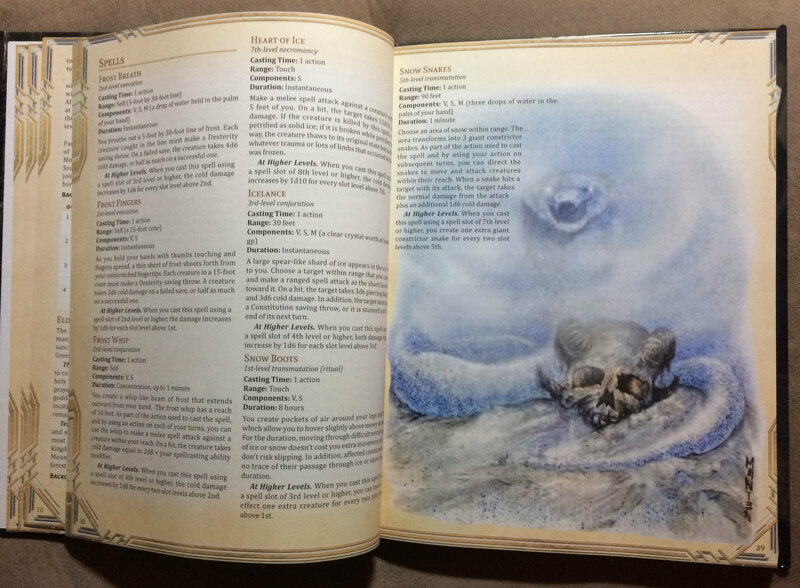 I would greatly appreciate it, if a spell list (like the ones in the PHB or XGtE) would be added to the book. Hi, Clemens. I'm glad you are happy with the product. That is a good question. The spells included in each deity's section are meant to only be available to those archetypes. However, the spells should also be available to other spellcasting archetypes that worship those specific deities with the DM's approval. The spells are meant to add flavor to the archetypes of a particular faith. If we had expanded and added additional classes, the spells would also be available for the additional archetypes. For example, a bard of Milil should have access to the spells listed for that deity. How long before the print version is again available. Terry, thanks for the question and interest in the print version. We ordered the review copies last week. They haven't shipped yet, but I'm hoping they'll arrive before next weekend, and then be available shortly afterward. I don't see there being any issues with the review copies, but we just have to be sure before making the print option available again. Hi, Terry. The print version is available again. Just got it in the mail today. It is a great addition to my 5e books. Thank you all so much for doing a wonderful job with the Deities. I have always felt they were not given the attention they deserved in fifth edition. Thanks again! Thanks, Terry! I hope you have some great fun with the book. Great work. One question, though - under Selûne, "moonblade" is described as a 2nd level spell, but you list it as a 1st level spell in the Silverstar Domain. Can you please correct whichever of these is a mistake? Hi, Joseph! Thanks for letting us know about this. After reading the spell, it's definitely 2nd level. I sent a message to the author of that archetype to see how we'll handle this. We'll have to move the spell to the 2nd level domain spot and replace it in the 1st level spot with another suitable spell. I would replace augury with moonblade in the 2nd level spot, and put faerie fire in its 1st level spot, but I would have to confirm that with Alex. So I ordered a print copy and pdf copy already, will I have access to revised pdfs to make edits in my books? Hi, Chase. Yes, the PDF was revised within hours of us being made aware of the omitted spells. You should have access to the full PDF with changes added and a small errata Word document that describes the changes. The layout didn't change significantly as no pages were added. There were two spells added for Silvanus and one for Corellon. I also added one line to the end of the Dawnstone artifact description that explains that it regains all its charges each day at dawn. Will a print version become available again? The print option is only gone temporarily while the print files are updated with a first small round of corrections we wanted to make immediately. It should be back soon! Clean, organized, jammed pack full of content. I can't wait for the non-human books and future product. Thank you, Patrick! I hope you have great fun using the book in your games. if you follow me on Twitter: @DragonRockGames, I'll post information about future releases there. The digital edition has been updated with the errata we've found so far incorporated into the document. I also uploaded a Word document with the errata. Love the product! the hardcover came in a few days ago. One question though. 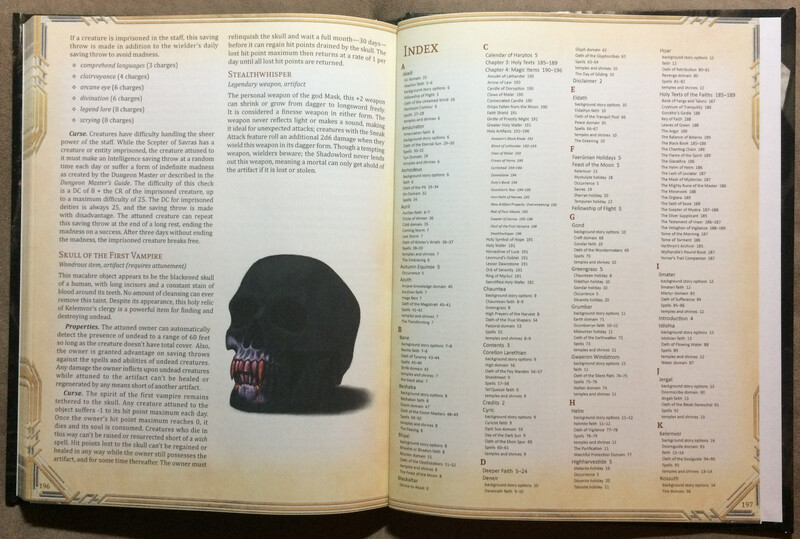 one of my players was looking at the Silvanus stuff, and noticed the spell "Moss Skull" in the list of available spells, but we cannot find the spell description anywhere. Any help would be appreciated! It looks like that one might have been lost in the shuffle during layout! We'll correct the electronic version ASAP and make a note to include it in errata for any existing printed copies. Hi, Mark! I'm glad you like the book. I just uploaded an errata document to the digital files. You should have access to the file if you purchased the Hardcover + PDF? If not, please send me a DM on Twitter or Facebook: @DragonRockGames and I'll send you the errata document. Yes! thank you so much! You guys work fast! I've got the errata, and my player is very happy now! thanks again! Hi! Great Product! I had a question about the Dawnstone Artifact. It says it has 20 charges but there is no text regarding it regaining charges or if it even can. thanks! The Dawnstone should regain all expended charges each dawn. We’ll make a note to update that for errata! Is this book considered canon in the published WOTC/Forgottem Realms setting? Hi, Joseph. Thanks for your interest! Alex answers this same question asked by Caleb below. Hey Scott, I did not see that below until you pointed it out, sorry. But what I meant if I buy it, will it be printed by WoTC or DMG? 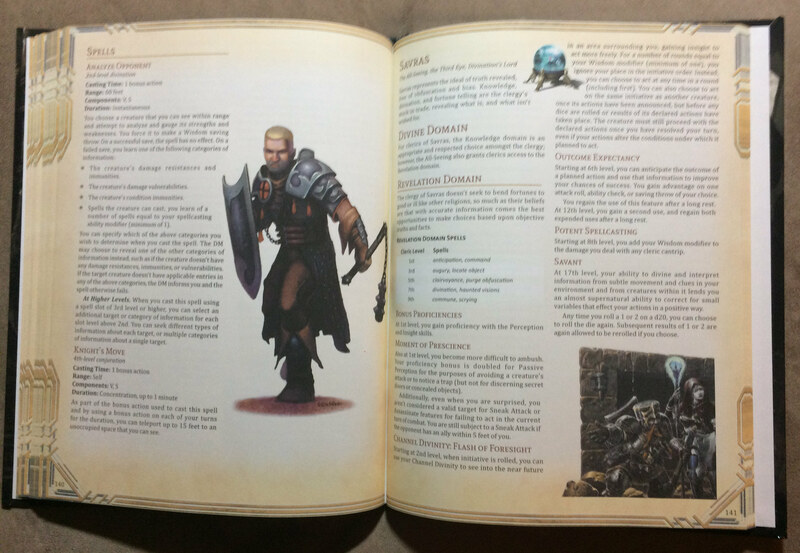 Would WoTC consider this a third party published book? Hi, Joseph! 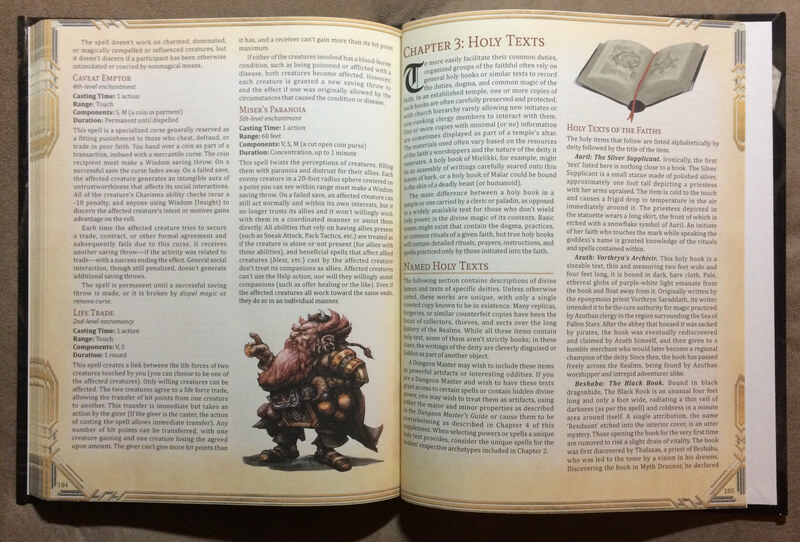 The book is printed by OneBookShelf's vendor through the DMs Guild. It would be considered a third-party product, though the DMs Guild and WotC receive their royalties from the sale. Alex, Micah, and I collaborated to produce the content using our in-depth research of both previous and current edition materials. I ordered both copies of the hardback versions to review before release, and the print quality is very high (Better than expected). The pages are very thick and the binding should hold well too. I was careful to keep non-white colors away from the book's spine while laying it out to improve the glue's hold. The main difference between the standard and premium versions is the ink quality. We have some great art in this book, with well over 100 images gracing its pages. The colors are more brilliant in the premium version, but the standard looks good too. Many thanks for the clarification! Purchase is impending!